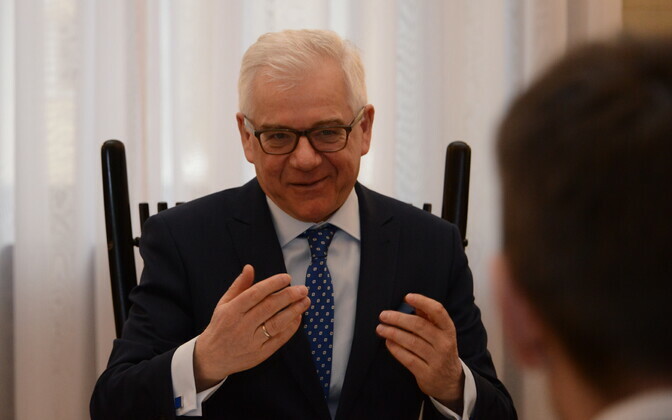 Minister of Foreign Affairs Sven Mikser (SDE) met with Polish colleague Jacek Czaputowicz in Warsaw on Friday, where the two discussed the relationship between Estonia and Poland, the rule of law in Poland and the Rail Baltica railway project, among other topics. On the subject of Polish rule of law, Mikser said that a solution must be found for the current situation, in which the rule of law is being threatened by Polish reforms of its judiciary, via dialogue between Poland and the European Commission, according to the Ministry of Foreign Affairs. "A strong and united Europe, where issues are solved through political dialogue, not by punishing member sates, is in Estonia's interests," Mikser noted. "It is important to arrive at a solution together which does not break up unity or hinder cooperation. At the same time, it must be taken into account that all EU member states follow the principles of a law-governed state." On the subject of the Rail Baltica railway project, which will involve the construction of a high-speed railway line from Tallinn to the Lithuanian-Polish border, Mikser said that Poland's support and contribution are needed in order for the project to succeed. "Regional economic cooperation will become stronger when Rail Baltica is completed, and Polish as well as Baltic entrepreneurs will benefit from this," noted the Estonian minister. "Poland's support would increase Rail Baltica's funding chances in the EU's next long-term budgetary period." The two foreign ministers also discussed the synchronization of the Baltic countries' electrecity grid with the Continental European system, which is important for Estonia's energy security. "It is important for the security of the Baltic countries to join our power grid to Europe's," Mikser noted. "We acknowledge Poland for its constructive cooperation thus far, and hope to reach political agreements this summer in order to move forward with the project." The two ministers also discussed the NATO summit to be held this summer. According to Mikser, the meeting should provide direction for the further strengthening of NATO's deterrence and defense ability. The alliance must also work on renewing defense plans as well as updating management structures. Mikser also introduced his colleague to Estonia's priorities for its non-permanent membership of the UN Security Council for 2020-2021.